1. Boil the pasta for about 10 minutes or until cooked. Drain and rinse in cold water, then leave to cool. 2. Deep fry veggie Belly for 2 minutes. 3. Pour some oil in a saute pan, heat moderately then add garlic and mushrooms. 4. Season with soya sauce, mushroom sauce and ground pepper. 5. 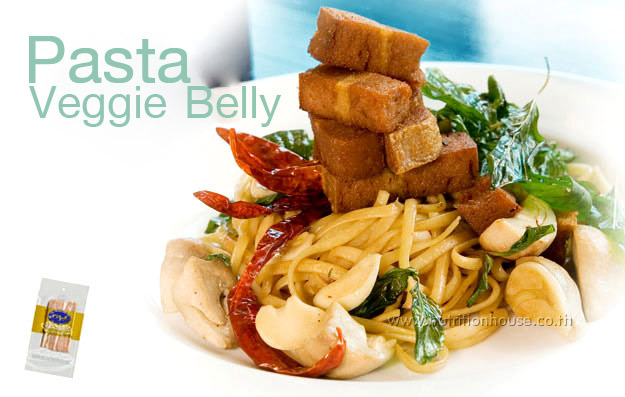 Place pasta on a plate, and top with fried veggie belly. Garnish with fried red chilli and basil. Copy right by nutritionhouse.co.th 2005 All rights reserved.